1) Smoke Alarms. Here in Ontario, there are strict requirements for smoke alarms that vary depending on the type of occupancy. 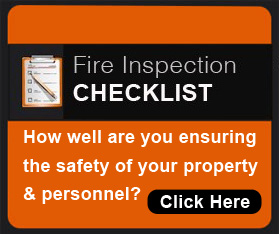 No matter where you live, though, landlords are required to have working smoke alarms in place. Residents also share responsibility for smoke alarm maintenance and can be fined for tampering with the safety device. Is there a working smoke alarm on your floor? Is there an alarm near your sleeping area? Did you test the alarm? If you are in a dormitory or larger building, is there a fire alarm? Are alarms audible from your room? Remember that even in the event of a false alarm, you should never remove batteries or disable the alarm. Smoke alarms should be tested monthly; set yourself a recurring reminder, so you don't forget. 2) Fire Sprinklers. Be sure to ask whether or not there are fire sprinklers in your prospective new residence, and give preference to living quarters with sprinklers. In the event of a fire, having working fire sprinklers is the closest you can come to a guarantee of survival. 3) Escape Routes. Just as you likely did at home with your family, you need to think about an escape route when you move to a new place. You also need to identify a Plan B route, as a backup. Know where your windows and doors are, and know which ones are your closest and best means of escape in an emergency. You don't want to discover a door is blocked or a window is painted shut during a fire. If there are security bars on the windows, is there a quick-open device accessible from the inside? On an upper floor, secure an emergency escape ladder tested or endorsed by a reputable fire safety organization. If you are in a high-rise, you might want to consider a SkySaver device for your emergency kit. Larger buildings likely have a formal fire safety plan posted; if so, familiarize yourself with the evacuation procedures. Practice your escape route. 4) Carbon Monoxide Alarms. If you are in Ontario, your building may be required to have a carbon monoxide (CO) alarm in place, particularly if there is a fuel-fired appliance (natural gas, oil, propane or wood). You can check with the local fire department to confirm which laws apply. 5) Fire Extinguisher. Don't count on someone else to know how to use one. Learn the basics before a fire happens. If necessary, get your own. 6) Electrical Safety. Be very careful with electrical cords and charging devices. Look for extension cords with the SA or ULC mark of approval. Don't overload power strips, extension cords or outlets. Don't connect multiple extension cords together. Check your light bulbs for the correct wattage. Do not staple wires or extension cords. Do not run electrical cords under carpets, doors or through windows. Keep electronic equipment away from anything that can catch fire. 7) Fire Separations. In older homes, you may be renting a room that has been converted from the original structure. If that is the case, a building permit would have been required to confirm fire exits and fire separations between units conform to Ontario Building Code and Fire Code. Be wary of basement units and single-family homes that have been converted to accommodate multiple rental units. If the building owner is unable to answer questions to your satisfaction, you might not want to rent there. If you already live in such a unit and have concerns, you may want to contact your local fire department for additional information. Verify there is an A-B-C rated fire extinguisher in the kitchen. If you are sleep-deprived or intoxicated, avoid cooking. Remain in the kitchen to monitor your food while cooking. Should a grease fire arise, do not pour water on it. Instead, use baking soda. If people around you have been drinking, keep an eye on their smoking or cooking. Keep the number of guests manageable. Check around furniture cushions near where people have been smoking, particularly before going to bed. If people must smoke, try to limit it to outside. Don't dump ashtrays into the garbage can unless you have poured water over them completely (embers may cause a fire). If you must use candles and incense, don't leave them unattended. Keep them away from flammable objects like paper, books, clothes, bedding, window dressings. 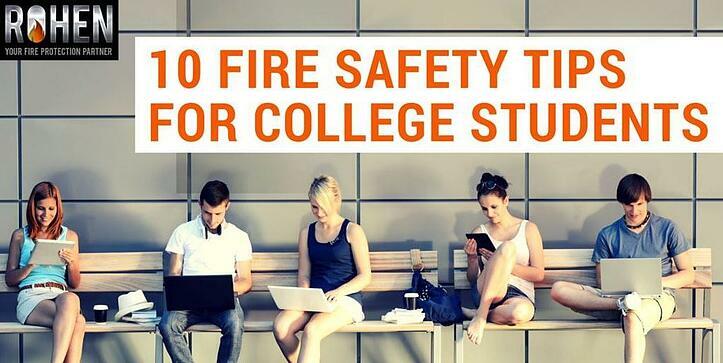 Get more fire safety tips for college students here from the most-shared Campus Fire Safety Month content.